Tail length is approximately 17 - 21cm roughly the same size as the body length. 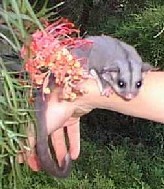 Sugar gliders live in dense to medium eucalypt forests, having a home range of about 3 hectares. It can volplane for at least 50 meters through the trees, not a bad effort when we consider the size of this animal. It sets off with its hind legs leaping from tree to tree, spreading membranes, which extends on each side of the body from the fifth finger to the first toe of the foot. It steers and maintains stability by varying the curvature of the left or right membrane. When it is about 3 meters from target tree it brings its hind legs in towards the body and with an upward swoop lands with four feet on the bark. Unfortunately they do not always estimate the distance quite right, and are sometimes found at the base of a tree, dead, or with head injuries, due to collision of a branch or the trunk of the tree. 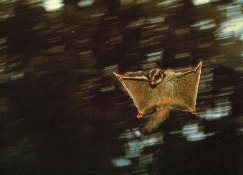 The Sugar Glider has a variety of calls, a shrill yapping that is a warning to others of danger. They will also emit a sharp threatening growl, which you may hear when they are fighting. Chatter also takes place in the nest, this is usually not heard by us, it is a gurgling sound, heard by carers when we are lucky enough to have the pleasure of caring for one of these species. They nest in tree hollows, once again we are reminded how important the old trees are for our native animals, as they are used by so many species for nesting and shelter. The nest is called a den and is lined with gum leaves. Social groups are made up of up to 7 adults and their young sharing a common nest. The male uses his scent glands to mark all members of the group, and intruders are shown no mercy. Mating takes place in June so young is emerging in spring when food is abundant. The female will normally produce 2 young, they remain in the pouch for 70 days, then stay in the common nest for another 30 days. At about 3-4 months old they will venture out at night usually on the mothers back, or close behind her. At the age of 7-10 months old, both male and female young have to leave the home territory, if there has been a loss of a female, they will allow a young female to stay with the family group. Males will have to find vacant territory, mortality rate at this stage is high, especially as clearing, loss of habitat, introduction of cats and dogs take place in areas where these animals are found. 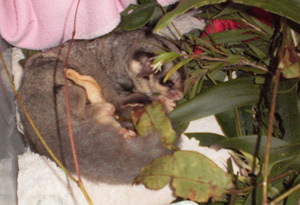 The Sugar glider lives on gum produced by acacias, sap of certain eucalypts, new tips of eucalypt leaves, native flowers such a Grevillia, Bottlebrush and insects. If the weather is very cold they will conserve energy by huddling together or by becoming torpid for up to 16 hours at a time, they may also do this if food supply is short. Head and body length for both male and females are 17centimeters on average, the long bushy tail measure about 19 centimeters. Males are a bit broader and weigh in at 140gram females 120gram average. They are bluish grey above, and underneath a pale brown colour, black stripe runs from the eyes to mid back. T ail is grey to almost black and can have a white tip. 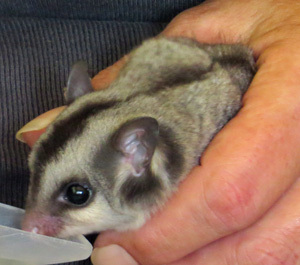 Sugar gliders are found along the coastal strip of Eastern Australia from Tasmania through to Northern territory. Predators include owls, feral and domestic cats, kookaburras, lace monitors and foxes. Main reason for Sugar gliders coming in to care with WIRES is due to cat attacks, as was the case with this little sugar glider. She was brought in to care in her dead mothers pouch together with her brother, both died due to infection caused by the cat's claws 2 days after coming in to care. Many native animals drown in cattle water troughs. They will try to access the water but if they fall in they can not get back out..
A simple solution to this is to put in a stick or hang a rope from the edge of the trough so that any animal that fall in can climb back out. Reference: The Australian Museum. 1996. "The Complete book of Australian Mammals." Native wildlife unfortunately do not fare well when they encounter domestic pets such as cats. This Sugar Glider was found hanging upside down under a house, close by was regurgitated cat kibble and a dead mouse. WIRES were called as soon as the person found the glider. The caller thought the glider may be suffering from a concussion.. It was soon discovered that concussion was not the issue as the little glider had multiple puncture wounds around his neck and his back legs were paralysed. Once in WIRES care he was placed in intensive care and given pain relief and much needed rehydration fluid. His wounds were cleaned and antibiotics were prescribed by the vet, it was now a waiting game to see if he could recover from his ordeal. Unfortunately most gliders that come into WIRES care do so due to having been caught by domestic cats. Domesticated cats are opportunistic hunters and will hunt day and night, they're just doing what their instincts tell them. Currently there is no suitable way to control the impacts of feral cats, but the impacts of domesticated cats can easily be halted by simply confining you cats 24 hours a day. 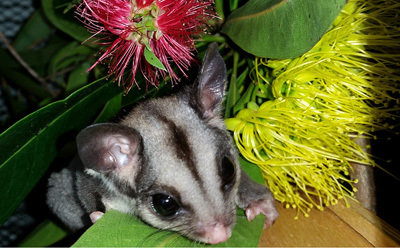 Put multiple bells on your cat’s collar in order for native animals such as this glider to hear the cat approach. Steralizing your cat makes them less likely to roam and hunt and it will ultimately save you money for vet bills as the cat is less likely to fight with other cats and get injured. This little fellow is a Sugar glider; he was taken into care after being discovered in the pocket of a person that most likely thought he was doing the right thing by saving him. When Smudge, as he was named, was taken into care by WIRES he was a mere 32 gram, bedraggled, malnourished and in a very sad state. Sugar gliders are social creatures; they live in groups made up of up to 7 adults and their young sharing a common nest. The male uses his scent glands to mark all members of the group. The female will normally produce 2 young; they remain in the pouch for 70 days and then stay in the common nest for another 30 days. At about 3-4 months old they will venture out at night usually on the mothers back, or close behind her. At the age of 7-10 months old they are independent. 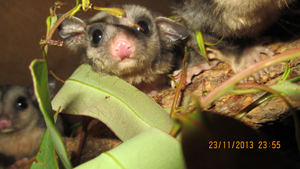 Sugar gliders live in dense to medium eucalypt forests, having a home range of about 3 hectares. They can volplane for at least 50 meters through the trees, not a bad effort when we consider the size of this animal, adult male weight is on average 160 gram and female 120 gram. Marsupials are born undeveloped and must have the correct nutrient in order to develop. Smudge was struggling and needed intensive care. After three weeks of proper nutrition and housing, things started to look better for Smudge, he was ravenous and putting on good weight. 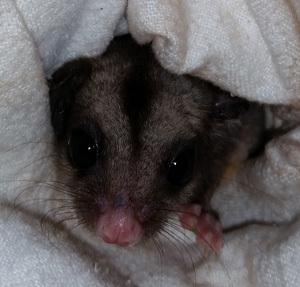 Smudge was released back to the wild after 2.5 months in care joining an already established group of Sugar gliders. Should you ever find a little glider such as Smudge, please call WIRES straight away. As tempting as it can be to hang onto these animals they must be handled correctly, given the proper nutrition in order to survive long term. And escapes the local python Gus! Sugar Gliders are beautiful little creatures that we rarely notice as they emerge from their homes after dark. As they travel mainly by gliding silently through trees at night we are often not aware that they are calling our gardens home and doing us a great service by feeding on lerps and other insects. Unfortunately predators are numerous due to these gliders being so small. The average adult weight is 120 gram with a beautiful long fluffy tail approximately 20 cm long, the same length as their body. This little female was discovered in the mouth of a domestic cat. It was soon discovered after she was brought into WIRES care that she was carrying two little joeys in her pouch. Unfortunately due to extreme stress and paralysis she lost her joeys and both were too immature for us to save. She was given emergency treatment on arrival and the following morning she was taken to Goonellabah Vet clinic where x-rays showed no spinal damage. It is hoped that her paralysis may only be temporary. Bacteria from a cat attacked animal can be treated successfully if the animal comes into care within 4-6 hours; chances for survival become less as the hours go by if not treated. The outcome for this little lady is still uncertain, she is putting up a mighty battle for survival, her carer will give her every chance possible and we hope for her return back to her family group. Sugar Gliders nest in tree hollows, once again we are reminded how important old trees are for our native animals, they are used by many species for nesting and shelter. 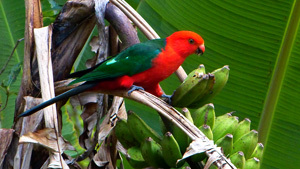 The nest is called a den and is lined with gum leaves. Social groups are made up of up to 7 adults and their young sharing a common den. The male uses his scent glands to mark all members of the group, they are territorial and intruders are shown no mercy. Please ensure your cat is securely inside from dusk till dawn. Casino vet clinic received a severely injured Sugar Glider into care last year, she had been hit by a car which is of course most unusual considering gliders are tree dwellers and rarely come down on the ground. This female was unfortunately hit whilst gliding across a country road. 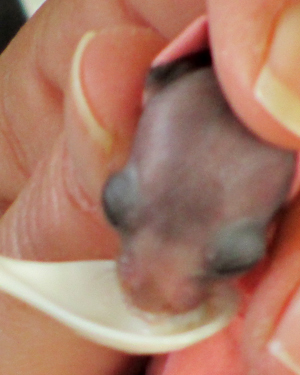 Sadly the glider was dead by the time she arrived at the vet, but in her pouch were two little joeys very much alive. Below are some images showing them as they developed whilst in care. Sugar gliders are nocturnal animals and do not venture out till after dark and they can go about their business under the cover of darkness. 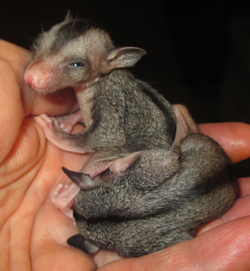 This little glider was found by Susan at Casino just after 8am under a tree. Susan waited with the glider till Melanie from WIRES arrived. It turned out to be a juvenile female with a nasty gash on its head. 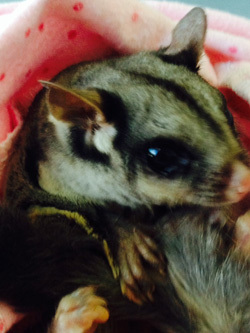 So how does a little Sugar glider end up with a gash on its head under a tree? There can be a few explanations one of which are trying to keep up with mum and falling from a great height and injuring herself on the way down. Trying to reunite a little glider in a situation like this can be extremely difficult due to not knowing where the colony is located as gliders travel quite some distance in an evening searching for food. If we were to take a little one like this back and let it go we would not be able to catch it again as we would need to if mum was not nearby, it is too young to survive without her. 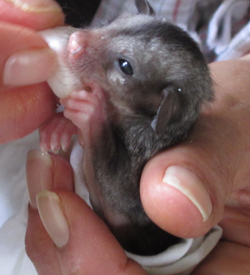 She will stay in care and join other orphaned Sugar gliders forming a family group. This little group will be released together with their own home being a sugar glider box when old enough to fend for themselves.